We’ve covered several stories this year about booby trapped mountain bike trails, where people trying to discourage riders actually put them in danger, but this one is especially nasty. 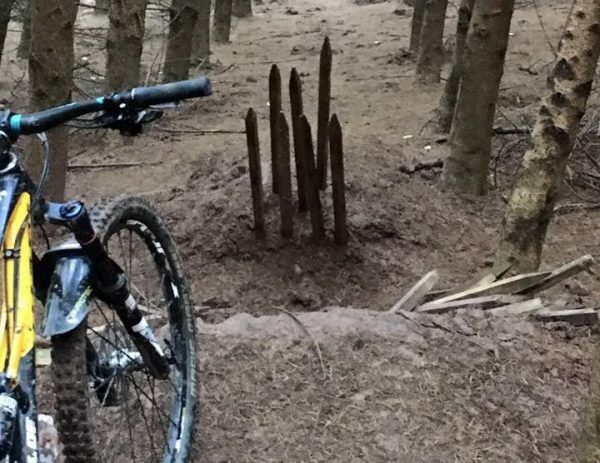 The latest incident of trail tampering comes from England where giant wooden spikes like a Medieval trap marked an unwelcome sign for mountain bikers. An image of the spikes spread across social media this week after a photo was posted to the Facebook page of a local bike shop, Twelve50 Bikes. The vast majority of users within the Delamere Forst in northern England co-exist peacefully among each other, a manager of the bike shop claims in a post. The local forestry officials apparently tolerant of riders even though the trails are often unofficial. The concern is that there may be other dangers out there yet discovered. The wooden spikes were stuck in the mud at the base of a jump. A spokesman for the Forestry Commssion told the Manchester Evening News they were shocked and removed the spikes as soon as they were notified. “We are appalled that anyone would do this in Delamere Forest and are grateful that no-one has been hurt,” a spokesperson said according to the newspaper. In England, as in other parts of the world, popular outdoor recreation areas near urban centers are stressed by many users. Managing these multiple interests among hikers, horse back riders and mountain bikers has become increasingly important as conflicts continue to arise when left unchecked. “Hopefully this is an isolated incident but if anyone does see anything dodgy going on then please report it,” said Rick with Twelve50 Bikes.